Christine Lagarde, Managing Director of the International Monetary Fund, was interviewed today by NBC News Chief Foreign Affairs Correspondent Andrea Mitchell. You can see that interview at Andrea Mitchell Reports at http://www.msnbc.msn.com/id/29974370/. Ms. Lagarde had many interesting things to say about the state of economies in Europe and the effect on the global financial markets, but that is not what caught my ear. What I found most interesting for my readers were the remarks at the end of the interview when the reporter asked Ms. Lagarde about her experiences as a woman, as a mother, as a lawyer, and as a world financial leader. Specifically, Ms. Mitchell asked Ms. Lagarde about her position on the “having it all” debate that has gotten so much attention lately in the US and her experiences with gender bias. Ms. Lagarde firmly stated that, in her opinion, women cannot have it all at the same time. She said that women must be patient with their careers, they must have reasonable expectations, and they must manage those expectations well. She also said that women must maintain a sense of humor when they are confronted by chauvinism, and that they need to remember that the offending man most often has a wife and daughter, and she implied that the issues women face in the workplace today are difficult for men to understand and to handle. Her best advice for women confronted with gender bias is, “When its tough, grit your teeth and smile.” She learned it from her swimming coach many years ago, and it is pretty good advice. With all humility, I must say that I heard an echo in the room during this interview. The themes articulated by Christine Lagarde are ones that I have been writing about for five years in two books and numerous speeches and public appearances. Today I was very proud to be in such good company. I have admired Christine Lagarde since she came on the international scene to rescue the International Monetary Fund from scandal. She took a forward-thinking approach to the problem and refused to get caught up in the events of the past. She had a job to do, and she did it well. She continues to do it well and to present one of the strongest and most impressive role models for young women professionals existing in our world today. 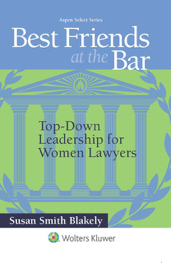 Come to the Book Launch Event for my new book, Best Friends at the Bar: The New Balance for Today’s Woman Lawyer (Wolters Kluwer Law & Business 2012) on Thursday, September 27th at Georgetown Law to hear more on the themes that Christine Lagarde and I have in common about women in the workplace. Meet other extraordinary women attorneys and professionals and take advantage of the proximity to these outstanding role models who care about your future and the future of all young women lawyers. You will be glad that you did! For more information on the Book Launch Event, e-mail me at [email protected]com. Hope to see you there! Hop on the Book Launch Express! Be meticulously thorough, scrupulously honest and, above all else, a gentleman [or gentlewoman] beyond reproach. Stephanie Martin, writer for LITIG8R TECH, captured the essence of the Best Friends at the Bar project in this interview. Hope you enjoy it! Standing at such a crossroads, many of these young women may find themselves searching for a roadmap. Luckily, that roadmap has arrived, in the form of two books written by attorney Susan Smith Blakely. 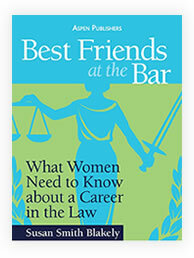 In her Best Friends at the Bar series, Ms. Blakely not only discusses her own experiences navigating the legal profession, but shares the experiences of many practitioners who have achieved success in their own rights. In What Women Need to Know About a Career in the Law, Blakely takes a high-level look at the opportunities and the challenges faced by women in the legal profession, and offers the perspectives of over sixty successful practitioners as testaments to the ability to achieve success. The New Balance for Today’s Woman Lawyer, by contrast, gets down to brass tacks. 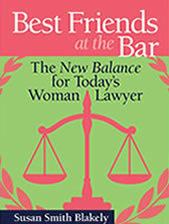 Sensing, from her experiences and research, that young female attorneys could benefit from even more advice on the issue of balance, Blakely explores the careers of 12 women attorneys, who faced the work-life balance and successfully dealt with it and the career transitions that it required. Their profiles and challenges are explored in chapters in the second half of the book. Throughout the book, Ms. Blakely encourages readers to be true to themselves, even if that “self” is outside the typical mold of an attorney. She also challenges readers to be honest with themselves; to consider their commitment to the profession, their limitations on the degree to which they can “do it all,” and their definition of success and happiness. 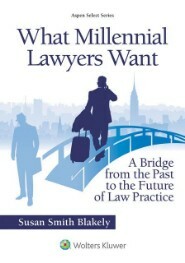 With a unique mixture of encouragement, tough love and examples from prospering attorneys, Blakely sets out to inspire her readers to take control of their futures in the legal profession and find their personal definitions of success. After reading The New Balance for Today’s Woman Lawyer, I spoke with Ms. Blakely about her mission. Stephanie A. Martin: What led you to write The New Balance for Today’s Woman Lawyer? Susan Smith Blakely: I started seeing a real problem in many talented women leaving practice mid-career. I would start to think, “I wonder how long it takes before she throws up her hands and gives up.” I started researching retention among women attorneys and found that little had been written seriously about the issue. In the over 3,000 books about lawyers and the law profession that I researched, most of the references to issues affecting women lawyers were trivial instead of practical and helpful. I didn’t want young women to be left with that as the only discourse informing them. The statistics are stark. Seventy-six percent of women lawyers who join large law firms immediately after law school graduation leave those law firms before their fifth year. They are in part influenced by the ability to repay student loans with the high salaries paid at those firms, and many attorneys work to pay off the loans, and then decide what they really want to do. A lot of women, as well as men, are discouraged in this paradigm; they become a bit jaded and cynical. I think that we don’t do law really well in America because we collectively have such a workaholic professional environment. Women in that atmosphere of work and aspiring to partnership, while their biological clocks are ticking away, start saying, “What do I do?” They make premature decisions to leave before knowing what their options are. The most important theme of my books is that each woman needs to have a personal definition of success. Until now, the industry has been dominated by the male stereotypical definitions of success which do not work well for women who want children and significant roles in raising them. I wanted my readers to get comfortable with the scope of issues facing them so they can confront them as informed professionals. SAM: You mentioned in The New Balance for Today’s Woman Lawyer that the environment facing Generations X and Y is much different than that faced by prior generations of women attorneys, in that there are more women competing at every level of career than ever before. Do you believe that is the case? SSB: It was easier to be a woman lawyer when I was starting my legal career. My graduating class at Georgetown University Law Center in 1979 was one-third women– not typical for law schools in those days. Usually the percentage of women was much less. I graduated and joined a firm of 22 men and only one other woman, a new lawyer who only lasted in that practice a year. That atmosphere was hard, and I had no female role models. However, I could really distinguish myself. I had talent and characteristics that were uniquely female and ultimately helpful. Women have an emotional intelligence that is unique to them. When I did well, it was huge cause for celebration; whereas now, there are so many women in the industry and they are competing against each other. I was the first woman to go to trial for large institutional law firm clients, and one of the first woman trial lawyers in construction contract law, and my representation included huge subway and other infrastructure contractors and representation of some of the largest design-build firms globally. I was so unique that I was enthusiastically embraced in that context in a way that would be unusual today. Then, you knew when you were breaking the glass ceiling – it shattered, and you heard it. Experiences like that drove us on and gave us energy to keep pushing toward the top. It’s not the same today. I wish women lawyers today had more opportunities to have those experiences. SAM: I’m sure you’ve heard of the recent Atlantic article by Anne-Marie Slaughter that made waves during the summer, in which she posited that women can’t have it all, at least not at the same time. With the demanding nature of the legal profession, how do you respond to Ms. Slaughter? SSB: I have a great deal of respect for her in writing the article. I found the article to be a wonderful springboard to start the discussion on this topic. I now want to get enough attention to my book and project, so that people can understand all of what needs to be discussed. I wish Professor Slaughter had been more clear about having it all, just not all at the same time. It’s regrettable that she didn’t stress that, and I was a bit disappointed by the overall negative tone of the article. I think it would be hard to convince most women in America that she does not have it all – a professor and former dean at Princeton, a former Director at the State Department, and she made the transition to and from those positions. It will seem to most of America that she does have it all. It’s important to show women that they can have some of it all of the time, all of it some of the time, but rarely can they have all of it all of the time. This is especially true during the child rearing years. It really depends on how you define “all”: if you approach it right and make good career decisions, you can have a really interesting, successful, satisfying career. Mine looks like a “zig zag” path. I reinvented myself over and over again because I needed to, but each “zig” and “zag” was interesting in its own right. Ultimately, it is what you make of it. That is why, in my book, I feature 12 profiles of women in the legal profession: I want young lawyers to look at women that have done it successfully and use them as positive role models. SAM: What kinds of things should young attorneys ask for from employers and mentors? How can we do so, being the low men and women on the totem poles? SSB: People love to talk about themselves. Engaging a senior person in a firm as a mentor is not a burden to them—they love to share their experiences. Young people shouldn’t be afraid to ask for mentoring. It doesn’t mean you’re perceived as needy, it means you are smart. You couldn’t possible know a lot about certain aspects of practicing, and no one expects you to. Don’t be afraid to ask; it’s what we’re here for. Many senior attorneys will be impressed by the fact that you’re curious to know how to be a successful attorney. Tuning into these considerations early and building business development skills also gives lawyers leverage when they ask for non-standard treatment and opportunities that are different, such as a reduced or flex-time schedule. When female attorneys started fighting for part-time schedules years ago, we often heard that we were “not committed” to the job. Demonstrating your commitment early and often will help to alleviate that problem. Asking for flexibility is much easier for the firm when you are contributing to the bottom line. While we want firm management to understand our needs, we must understand that it is necessary for us to understand the business of law and how we fit into the considerations that create a successful business. You will want the firm to ask, “How can we make this work, instead of starting over with a new associate?” It can cost up to $500,000 to replace a senior associate, and firms will want to avoid that expenditure if it is not necessary. If you have created that value by being a profit center, you will have more negotiating power. SAM: What is the ultimate goal of your books and your speaking engagements? What do you hope to achieve? I want them to have as much information as possible to make good, rational decisions about their futures. I want them to understand that career satisfaction and success is ultimately a matter of their individual definitions of success. I hope they will continue with their interest in law, and stay in practice one way or another, that somehow they make the time to commit to it while they are raising a family, and can go back to full time when their kids are grown. I actually walked away from my career for a while to raise children. However, it’s very hard to go on and off the career ramp, and I was strategic and fortunate. I want to try to help women stay in from the beginning. In the end, I believe that legal education in the United States is the best education in the world. I don’t like to see women give it up if they are interested and love what they’re doing. When the teenage years come for their children, I don’t want women to go into the corner and cry because they have given up their careers and their children are pushing them away. I want them to resurrect the woman lawyer that was there: light the afterburners of their professional goals and dive back into their work. Law firms are bleeding talent in this country, and it is a very big issue. They have to figure out a way to keep that talent at their law firms. The students at the top of the graduating law school classes are often women—they have shown that they have what it takes to be stars. They work hard, and do well, and have talent. Firms lose too many of those valuable associates mid-career. Succession planning is more and more important to law firms today as the baby boomer lawyers retire, and it is more and more critical to successful business to retain existing talent. The solution will only be found when women and men sit at the table together and exchange information to understand what is important to all of the players and come to mutually beneficial solutions. Thank you, Stephanie. Readers: Get the books and prepare for your future in the law. You will be doing yourself and your career a favor.